As you know, we are moving. One of the good things about this move is that our company's office will be moving into it's own official office space. YAY!! Some people think that having your business office at home is an awesome thing....most days it is. But there are days when you want interaction with other people...beyond Walmart shoppers. Before we moved from Alabama, I worked at a large law firm...corporate all the way every day. Sometimes I really miss that. So when we started looking for our permanent home and some office space, I stumbled across a company called WeWork. They offer what is known as a Coworking Community....offices that house all different types of businesses! Any company can rent office space in an office building for as long as they want....and it doesn't matter what type of business they have. This would be so awesome for us! We would have our own space but be able to interact with others as if they were co-workers in our business. See, a two-fer! And you all know how I love two-fers! This is such a great concept! WeWork offers office space across the US and in several countries. Their office spaces are gorgeous and offer so much inspiration while you work! They offer many different styles of office space so there is literally something for everyone! While I was disappointed to learn that they currently do not have space available in our area, looking at the design of the office spaces they offer started me thinking about what I would want in our new home office (since the official office will now be in an office building). I want our space to be casual, classy, relaxing, stylish. Since it will be used primarily for my blog writing, I also want it to be a space that keeps me on a "creative keel"! 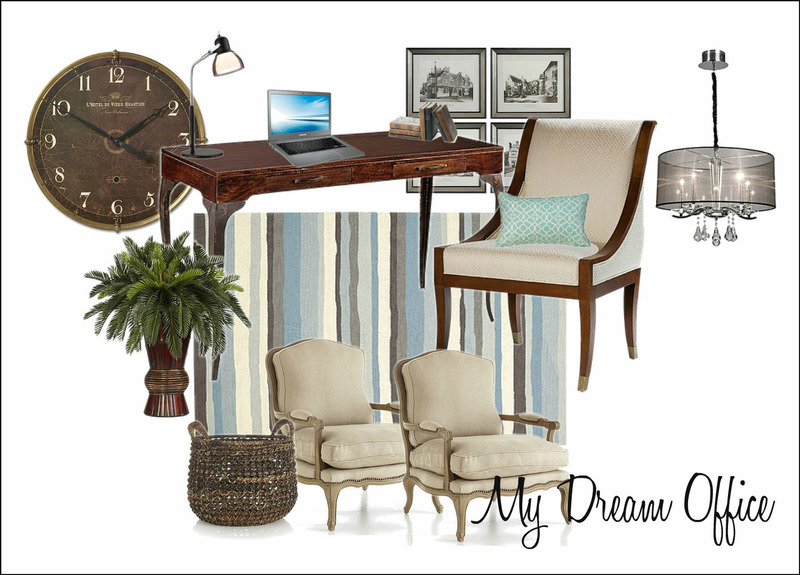 With that in mind, I came up with this inspiration board for MY DREAM OFFICE SPACE. I would want the style to be different so that I wouldn't have to build a wall or use a room divider to set it apart from the rest of the bonus room, which is where it will be located in our home. I want comfortable yet stylish chairs, a nice desk, neutral colors (to blend with the rest of my home), cute pillows and, of course, a cool rug! Oh, and don't forget the chandelier...no office would be complete without some bling! I really want to keep "office" style accessories out of this space. I've looked at printers, file cabinets, staplers, pen holders, etc. for long enough in our home and I'm ready for a brand new look! So, what do you think of MY DREAM OFFICE SPACE??!! Now that I have something in mind for our home, I get to decide how our business office will look! :-) And don't forget.....if you happen to need some office space, consider looking at one of the coworking communities at WeWork....I think you will like what they have to offer!! wondering how the house buying saga, is coming along now...???? Your dream office space is dreamy. Love everything you have on your inspiration board. They do have those office spaces here by us in Chicago that you can rent out when you need to meet with clients etc. A great idea. Good luck today. I love the concept of WeWork! You are exactly right about having the business office in your home. Yes, great for working at the desk in pajamas but probably doesn't set the best professional state of mind. And I feel as if we never get away from work. It's always there. Maybe this idea would be something Zack could think about when we fully retire. I wonder if there are any WeWork spaces in downtown? I'll have to tell him about this. Meanwhile, you have gathered together a space for your home office that is beautiful, Benita! I love it all and surely the artwork on the walls will be your own stunning photography. Maybe this delay in moving is for the purpose of giving you more time to do all this planning? Nashville doesn't have any right now, but I'm going to keep an eye out to see if they open a space here. In Dallas, they had something similar, but the space was a little overpriced. WeWork seems to have some great pricing. And you are so right....with it in the house, you never escape and always seem to be working. With an outside office, you can leave work behind and relax at home. Thank you so much Dewena! I hope I'm able to incorporate most of these things into the home office space, and yes, I will be using my photography as the wall art. :-) I have so much of it that I will be able to rotate it out on a regular basis...LOL. Perhaps so...giving my time to decorate the house in my head before actually getting there to do it in person. Hope you all are doing well and so looking forward to getting together with you once we get this move behind us! Hugs!! Your office space idea board looks fabulous!! Love the mix and styles you're leaning towards. So where are you guys moving? And that's what we are in...a temporary place. We've been here almost a year. Thank you so much Rue....it is classic and traditional. I see so many styles that I love but know they are just not me. I would have a Lucite desk and chair and add color all over the place if I were living in a very ultra-modern loft or something, but staying sort of traditional seems to fit this house. I'm curious as to what I end up with...LOL HUGS!!! Thank you so much Christine! Now if I can just find the things at a reasonable price! :-) Hugs!! This is nice, Benita. I really like the soft, subtle use of color and the mix of masculine and feminine touches! I hope this becomes a reality for you soon! i'm sorry for what i'm about to say . . . and you'll think . . . "no wonder she has hypertension!" LOLOL! of all the inept real estate agents . . . or agency . . . or WHATEVER! good lord. it should NOT be that HARD!!! or complicated. ye gads. that's worse than buying a car for pete's sake. back to our regular programming . . .
i think wework sounds amazing!!! and your choices for your own little office . . . as well. Tammy, you are hilarious!! I've been raising all kinds of a ruckus to anyone who will listen to me rant! Thankfully, our realtor blessed out the lender and gave the builder's agent a good earful as well. They have made this process as miserable as one can be! And you are right, it has been much worse than trying to buy a car!! Thank you so much Tammy. I just have to convince the hubster it's worth it! ;-) WeWork has some wonderful spaces. I will be glad when they expand to the Nashville area! Hugs!! Love your choices and colors! The clock is great and yes, you must have a chandelier. I love the idea of an office that doesn't look like one! I kinda have that in my house. I do all my blog writing, Etsy and email work on the couch with a tiny table for my laptop. My "office" is occasionally invaded by my husband when he wants to sit on the couch :-) P.S. I have other spots for an office but internet service is funky in it! Those french chairs definitely would fit into my dream office space. Have you thought of starting a rival company for shared office space like WeWork? Then you could have your dream space of a shared office AND make some money what at it. Aren't they gorgeous??!! When I saw them on Olioboard, I knew they would fit perfectly. Now to find them at a reasonable price! :-) I would definitely like to do something like that strictly for small businesses. WeWork has office space available for all size businesses, but I think the smaller businesses get left out in the cold sometimes. It is an idea worth exploring. Great colors and looking forward to the rest of the story. Love the office concept and the chairs look very comfy! Thank you! I hope I can pull it together to be very similar! I love the chairs! Oh boy...this house buying process is turning into a real life nightmare! I bet you could write a book about stress and (hopefully) relief ;). When we had our business, toward the end I worked from home more often than not and although it was super convenient the trade off is little or no interaction with people. After a while that gets old so I know what you mean. WeWork contacted me a few months ago also so I looked them up and was impressed with their conceot. They have great locations in the cities where they're set up too. Like you, I prefer an office that doesn't look so utilitarian and 'office like'. I love what you've curated! Very elegant ! A nightmare is exactly what it has been and it only got worse with the closing yesterday. I have been in tears for 2 days! Oh, you are so right! Having no outside contact with other people is horrible, especially since I’m such a social person and love chatting with others! I love the WeWork offices….they are all so different and I like that you can rent an office or a desk…just whatever you need! Thank you so much! I’m looking forward to trying to pull it together! Girl, I’m so sorry, I know that was a mess and it does seem to take a while to get things back in place from something like that. I want to get a tankless water heater as soon as we can. They take up so much less space and are not as much trouble, but just cost $$$.